Christmas is an annual holiday celebrated by the Christians on 25th December all over the world to celebrate the Nativity of Jesus Christ. Christians believe that Jesus is the son of God, the Messiah sent from Heaven to save the world. It is believed that Jesus was born to Mary in Bethlehem around two thousand years ago. Jesus was born in a manger because there was no room for him and for his parents, Mary and Joseph. The word Christmas comes from Cristes maesse, an early English phrase that means Mass of Christ. Christmas is a festival that fills joy, happiness and love in people's life. On this day, people go to church, sing carols, take part in special religious services, exchange gifts, decorate their homes with holly, mistletoe, lights, flowers and Christmas trees and organize family gatherings. On the Christmas Eve, churches around the world hold evening services. At midnight, most churches hold special candlelight services. Santa Claus is a popular character in the Christmas celebration who brings gifts for the children. This year Christmas is on Monday. So we all, Foodie Monday Blog Hop team members had decided to celebrate Christmas by keeping 'Christmas recipes' as 124th Foodie Monday Blog Hop theme. Well, this year I have already prepared the authentic Christmas Fruit Cake which is a healthy, non-alcoholic and vegan version. Also some melt in mouth egg-less lemon crinkle cookies are prepared and packed for gift. But gingerbread flavor is missing still in my house this Christmas. Though I always do go ahead with gingerbread cookies (man / woman 😉), but this year I made some crunchy biscotties that too with gingerbread flavor !! Gingerbread refers to a broad category of baked goods, typically flavored with ginger, cloves, nutmeg / cinnamon and sweetened with honey, sugar / molasses. 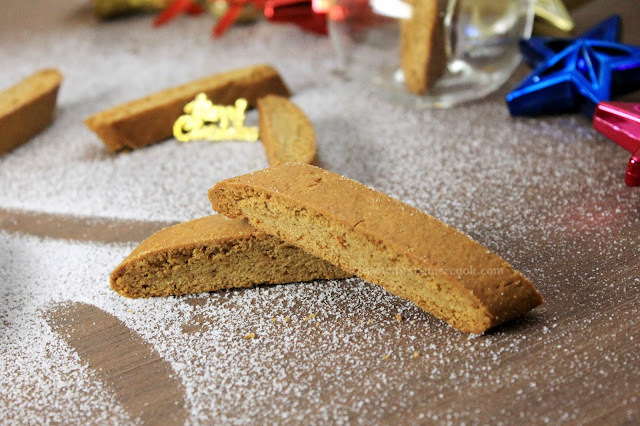 Gingerbread biscotties have exactly the same flavor which anyone can get from the gingerbread cookies but these are crunchy ones where as the cookies are soft and chewy ones. Since molasses is not available at my place, so I have prepared these gingerbread biscotties using jaggery syrup. If you have molasses, then just use molasses in place of jaggery syrup. The smell that comes out while baking these gingerbread biscotties, ahhaaa !! My entire house just becomes full of spice flavors. 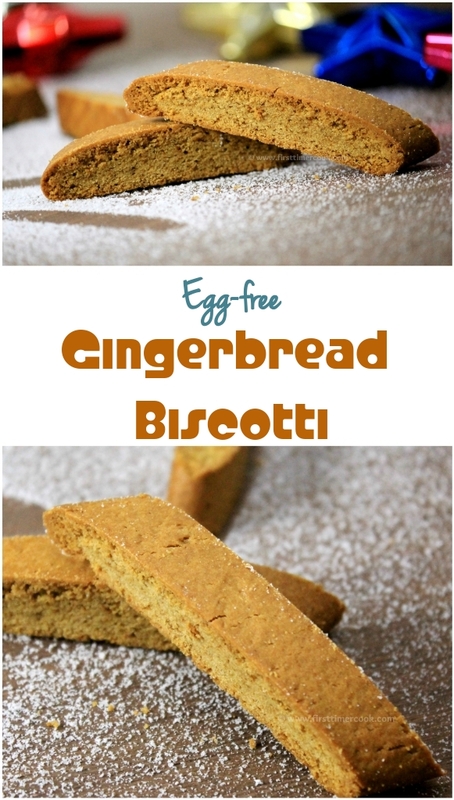 These biscotties are purely egg free and within a few minutes and with some easily available ingredients, anyone can prepare these flavorful, mildly sweet, well spiced and crunchy ones. Without taking time anymore, lets go in details. Sieve all purpose flour, baking soda, dry ginger powder, cinnamon powder, nutmeg powder and keep aside. In a mixing bowl take butter, jaggery syrup and milk. Mix well till a smooth texture using hand or electric whisk. Next add brown sugar and the sieved dry ingredients to the wet ingredients. Make a smooth and soft (little sticky type) dough. If the dough is too sticky, then add little amount of all purpose flour (add first 1 tbsp flour and more if needed). If the dough is too tight, then sprinkle little amount of water at a time. Divide the smooth dough into two equal parts. Place both dough on a baking sheet. Flatten and shape each into approximate 5 cm wide and 11 cm long logs keeping some space between both logs. Bake both logs for 25-26 minutes or until firm to the touch. Remove from the oven and allow to cool completely or at least 15-20 minutes. Using a serrated knife, cut the logs into 1 inch thick slices. Place the slices on their sides on the baking sheet. Again bake for 10 minutes and take out. Flip them and bake for 10 more minutes. Drizzle some white chocolate over these crunchy biscotties, munch right now or store in an air tight container to serve later ! Jaggery syrup should be at room temperature while using in the recipe. Use salt if the butter used here is not salty one. If you have molasses, then just use 1/4 cup molasses in place of jaggery syrup. 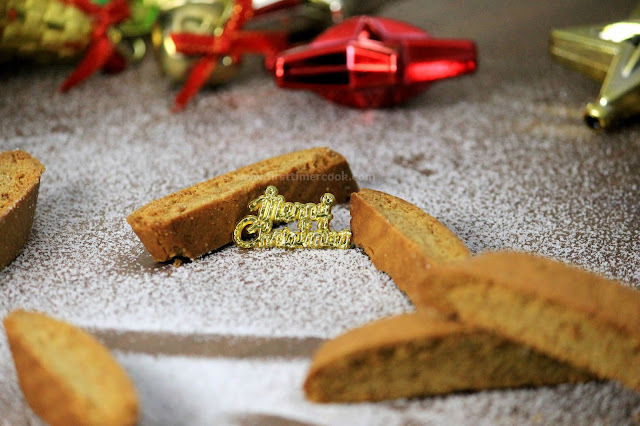 Since molasses is not available at my place, so I have prepared these gingerbread biscotties using jaggery syrup. If you don't have ready made spice powders, then just take whole ones and make a fine powder in a blender. 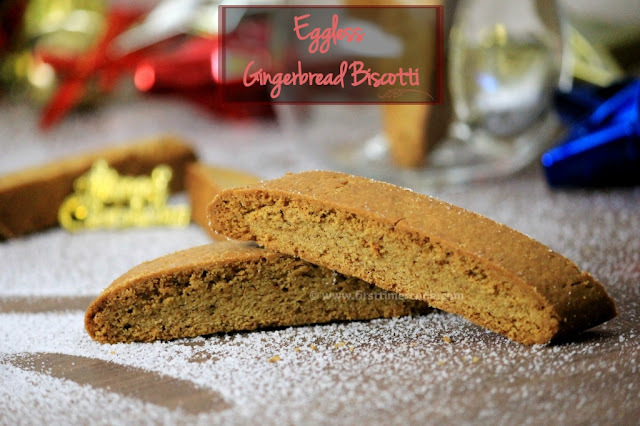 The Ginngerbread Biscotti sound so festive Sasmita...Merry Christmas to you ! Thank you so much Poonam and Merry Christmas to too !! Ginger bread and tea! Match made in foodie heaven and one of my fav combos! Lovely one! 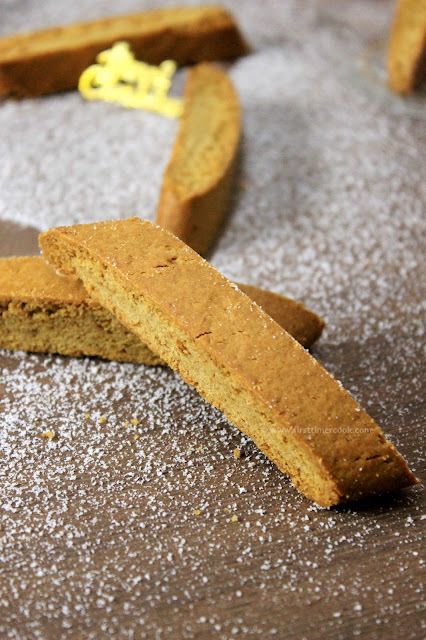 Biscotti are my favorite.Making them with jaggery is a great idea. I'm now craving for some! Such a yum and healthy Biscotti. Fabulous! !